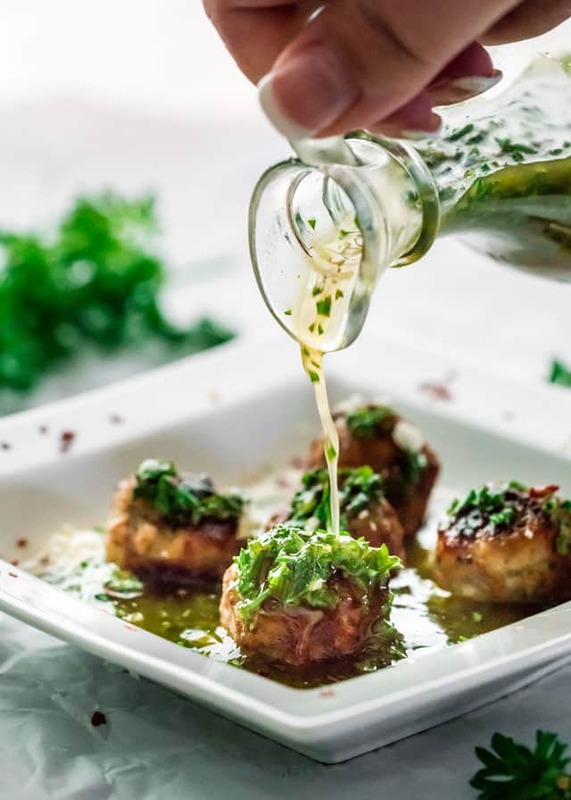 These Chimichurri Meatballs are epic, so easy to make, yet super impressive and perfect for your holiday party! 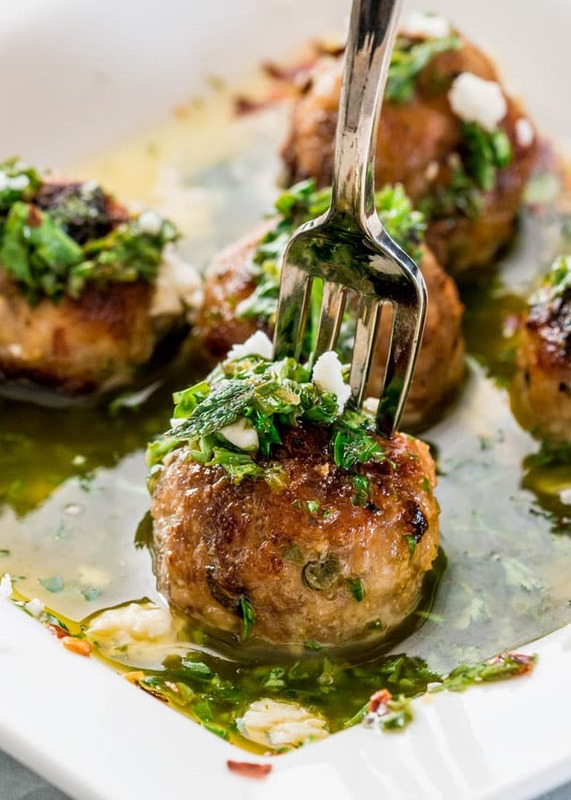 There’s nothing boring or bland about these meatballs, it’s the chimichurri sauce and feta cheese that take these meatballs to the next level of flavor. Are you guys all glad Christmas is over for another year? In a way I am, even though it’s my favorite time of year. I’m going to miss my Christmas movies and Christmas music, but we still have New Year’s Eve, so it’s not over yet! For New Year’s Eve I love to make all sort of appetizers. And if you know me just a little bit because you follow my blog, you will know that I love my meatballs, so I’m always looking for new ways to serve them. 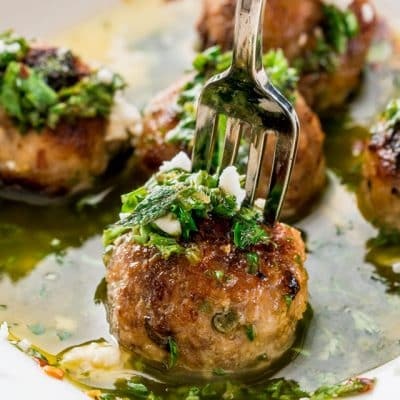 I’ve made chimichurri sauce before and absolutely love the flavors, I’ve made it with steak before and it’s absolutely incredible, but it also makes a great combo when served over these meatballs and garnished with some feta cheese. They look super impressive, trust me and everyone will think you slaved over them for hours. Truth be told, you can use store bought meatballs to make your life even easier and all you’d have to do is make the chimichurri, however I do make my own meatballs, in fact I don’t think I’ve ever purchased store bought meatballs. But that’s just me, I love everything freshly made, especially meatballs, since they’re really simple to make. You basically mix all the ingredients together and shape them into balls. This is fun to do, especially if you have children. Trust me, there is nothing complicated here, and I’m guessing if you’re making these for a party, you don’t want to do complicated, but you still want your food to look good and most importantly taste great and these meatballs deliver. These meatballs are fried, but I’ve provided instructions for baking them as well. Sometimes, I find it easier to bake them rather than frying them, and they won’t be dry at all since you will drizzle that yummy chimichurri sauce all over them. It’s such a great combination, especially with the feta cheese, all 3 elements go really well together. The great thing about these meatballs is that you can actually make them ahead and store them in the fridge until ready to serve. I would just heat them up a bit in the microwave then assemble them with the chimichurri sauce and feta cheese. 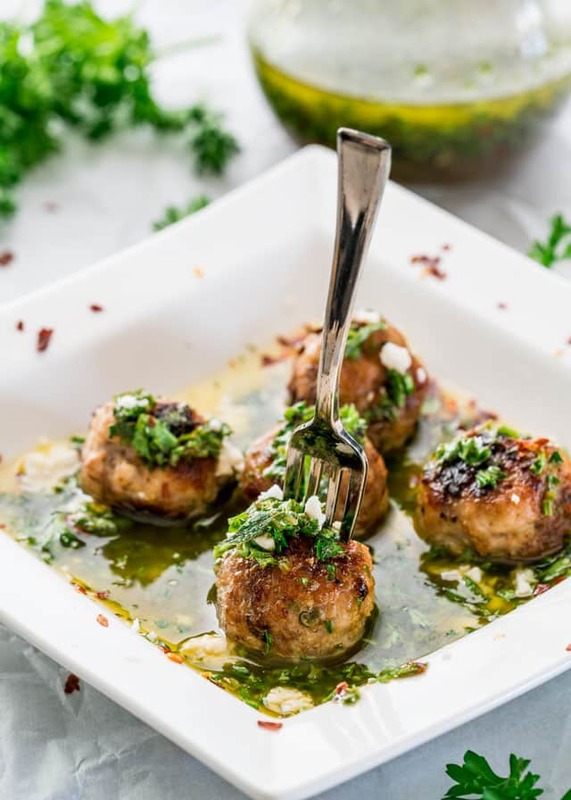 These Chimichurri Meatballs are epic, so easy to make, yet super impressive and perfect for your holiday party! 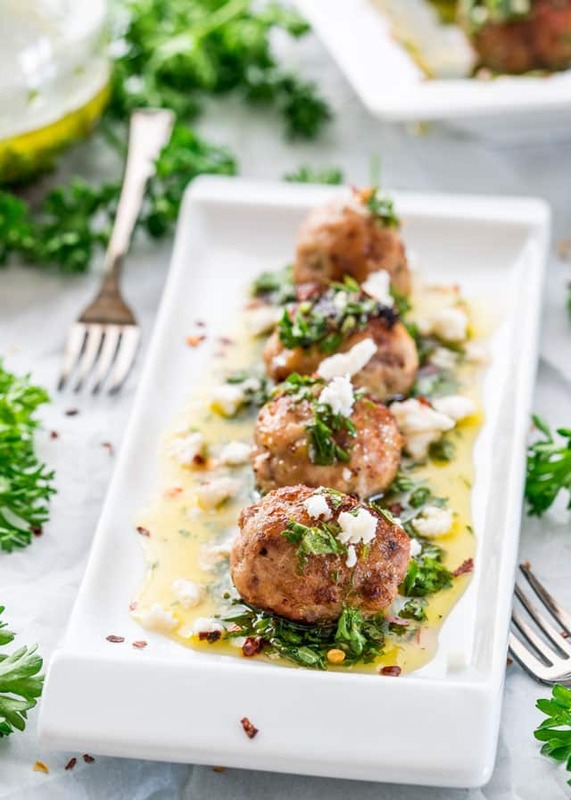 There's nothing boring or bland about these meatballs, it's the chimichurri sauce and feta cheese that take these meatballs to the next level of flavor. In a large bowl, combine the ground pork, ground beef, breadcrumbs, green onions, garlic, salt, black pepper and egg. Form the meatballs into small 1 inch balls. Heat the vegetable oil in a large skillet. Add the meatballs and fry until golden all around, about 7 minutes. You will have to do this in 2 batches, so do not overcrowd the meatballs. In a medium size bowl, whisk together the parsley, olive oil, red wine vinegar, oregano, red pepper flakes, lemon juice, salt and pepper. Let it sit out at room temperature until the meatballs are ready. To assemble, pour about half of the chimichurri sauce on the bottom of a platter, then transfer the meatballs to the platter. Top the meatballs with remaining chimichurri and garnish with the crumbled feta cheese. Alternatively, you can bake the meatballs by placing them on a baking sheet lined with parchment paper and baking them for 20 to 25 minutes at 400 F degrees or until done to your liking. These meatballs can be made with any type of ground meat that you prefer. This recipe yields about 48 meatballs, and nutritional information is calculated based on 3 meatballs per person. I have made these twice for parties. I substituted beef for bison and added rosemary to the meatballs. Amazing!! Is there a substitute for red wine vinegar ? You can use apple cider vinegar or balsamic. What would happen if I didn’t use breadcrumbs ? The breadcrumbs hold the moisture in the meatballs so they’ll come out more dry than ours. I made tapas for Christmas Day dinner this year. I made these meatballs with chimichurri. It was the first time most of my family had ever had chimichurri, they LOVED them! This is now my go-to meatball recipe. It’s so delicious! Yes, for sure, just refrigerate it. Hi. What would you suggest to replace the pork? The recipe is very interesting! Oh if you’re looking for a healthier meatball I’d go with chicken or turkey. Let me know how you like it if you try it. I made these little jewels with ground chicken and ground round today. I LOVE them. The sauce was perfect with the rice I made to go with the meatballs. Then, I got ambitious and made the Dutch meatballs. Oh my gosh…..what a treat. Delicious! Perfect for a snack food for me as I can only eat very small amounts at a time. Thank you so much for the delightful recipes. Next recipe….definitely the Indonesian meatballs. Made these tonight and OMERGOD! They are so good! Was worried they might be bland. Ton of flavor and really easy to put together. These look great, can they be frozen? Thanks Fenne, I’ll certainly be trying them. Is there another cheese you could recommend? Hi Jane! Basically the feta cheese just adds a bit of saltiness so if you could find something similar from cow’s milk that would work, I think some blue cheese would be perfect with these meatballs. I use some of the Mexican cheeses. Queso blanco is excellent. Also manchego and Chihuahua cheeses are good. These look great. If we want to reheat these in the oven rather than microwave, what temperature for how long would you recommend? Thanks! I would reheat them at 300 F for about 15 minutes. You’ll have to place them on a baking sheet in a single layer. You should also watch them because the time could vary. My pleasure! Hope you like them!